Speed it nothing without control, this doesn't just mean handling but also BRAKING! 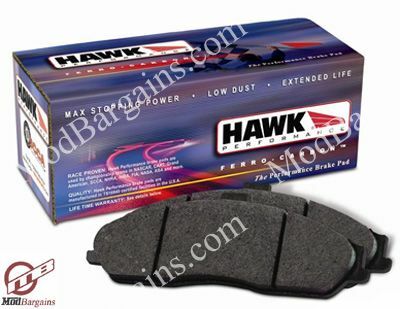 HAWK performance HPS brake pads will give your VW Jetta Mk V just that with increased heat resistance, reduced braking distance, and reduced brake fade! HPS - High Performance Street disc brake pads are world renowned for increasing stopping power on your street legal vehicle. Increasing the performance of your vehicles braking system is easy when you choose Hawk Performance’s HPS braking compound. This unique Ferro-Carbon formula was developed for street performance using the safety and quality of Aerospace and Motorsports severe-duty friction technology.